Attorney Ordered to Identify Dead Client Who Taunted James Woods on Twitter. The actor moves forward in a lawsuit over a "cocaine addict" tweet. The actor moves forward in a lawsuit over a "cocaine addict" tweet. James Woods is continuing to pursue a $10 million defamation lawsuit against an anonymous individual who tweeted Woods was a "cocaine addict." Not even the reported death of the defendant is stopping the actor. On Tuesday, over objections that Woods was looking to harass a dead man's family, a Los Angeles Superior Court judge ruled that the attorney for the defendant must identify his deceased client. Woods brought the lawsuit in July 2015 against "John Doe," an individual tweeting as "Abe List." According to the complaint, Woods wanted to send a message to those using social media to "propagate lies and do harm." In February 2016, Woods experienced a significant victory when a judge rejected an anti-SLAPP motion arguing that the "cocaine addict" tweet was "a constitutionally protected political insult," the type made routinely by Woods as "a well-known part of Twitter's culture of political hyperbole." 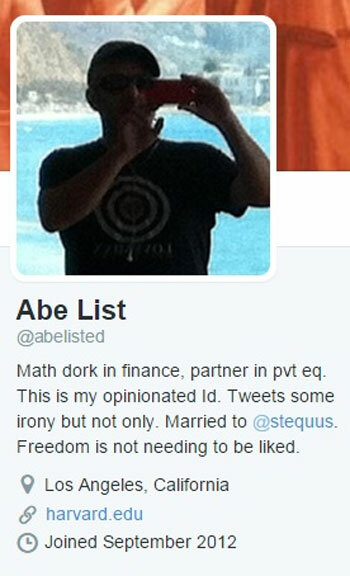 The anonymous defendant filed an appeal, but that was cut short thanks to the reported death of "Abe List," whose social media profile identified him falsely as a Harvard-educated partner at an Los Angeles-based private equity firm. "The slime who libeled me just dropped his appeal contesting my victorious SLAPP motion," Woods tweeted. Upon a reply noting that the guy had died, with other commentators expressing outrage, Woods responded, "Learn this. Libel me, I'll sue you. If you die, I'll follow you to the bowels of Hell. Get it?" Woods later deleted this tweet, but he was serious in some respects. The lawsuit proceeded with Woods' attorney Michael Weinsten questioning the defendant's attorney Kenneth White on Nov. 14. At a deposition, White refused to identify his client, so Woods brought a motion to compel this information. The actor argued that White's client no longer had privacy rights because of his death (which Woods hasn't conceded actually happened). It also was argued that information related to the identity of "Abe List" wasn't protected by attorney-client privilege and was "highly relevant and critical" to the prosecution of the defamation claim. In opposition (read in full here), White pointed to a screenshot of Woods' "I'll follow you to the bowels of Hell" tweet. "Mr. Woods asserts that his purpose is legitimate and that he does not seek to harass or abuse Mr. Doe's survivors," White wrote. "But Mr. Woods' own public statements give the lie to that assertion. Mr. Woods wants to do just what he said he wants to do: publicly harass and vilify a dead man and his family. The Motion is meritless, and is a transparent attempt to abuse the discovery process to exact twisted revenge by harassing Mr. Doe's family." White added, "It is an unfortunate fact of modern life that online celebrities, including Mr. Woods, can and do wreak havoc on the lives of private individuals by inciting followers to attack them. See, e.g., Jenna Johnson, 'This is What Happens When Donald Trump Attacks a Private Citizen on Twitter,' Washington Post, December 8, 2016 ..."
Let any good he has ever done be wiped out. Let the name 'Charles Carreon' be synonymous with petulant, amoral censorious douchebaggery." On behalf of Woods, Weinsten wrote in a reply brief (read here), "if Woods responded to AL's harassment by using strong language, such conduct was purely defensive and justified by AL's defamation. Stated otherwise, Woods' tweets do not evidence any 'harassment' that would allow White to withhold AL's identity." White also resisted identification on the stated grounds that the entire purpose of his representation was to shield his client's identity and that doing so would subject his client to civil liability. White argued he couldn't be forced to break privilege, whereas Weinstein retorted this wasn't about protecting confidential communications and that even if not, White had waived privilege by disclosing certain material facts at the deposition. The judge now has ordered White to reveal the name of his client. White provided his comment to the ruling. "Sometimes in law the bad guys win," he said. "I remain proud to have represented Mr. Doe in the face of Mr. Woods’ frivolous and petulant case. I’m pleased that the court denied Mr. Woods’ demand to compel me to answer a number of other questions, and that the court denied the meritless demand for sanctions."